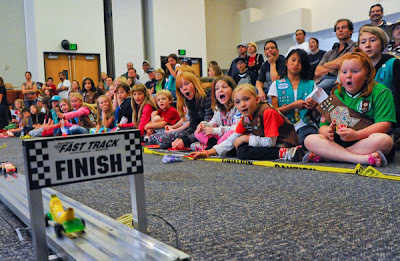 In California, the La Mesa-Mount Helix Patch reports that on Saturday, about 120 Girl Scouts and their families cheered 50 tiny wooden racers rush down an indoor track at St. Andrew’s Lutheran Church on Lake Murray Boulevard just north of La Mesa. Event organizer Terri Roberson called it a Girl Scout “He and She” event that gives dads the chance to make derby cars with their daughters, who represented at least a dozen local troops. The event was hosted by Junior Girl Scout Troop 6496 of Murdock Elementary and Cub Scouts from Pack 319.